The past year was a tough one for FIFA, one that included an FBI investigation, arrests, and Sepp Blatter’s ban. Indeed, the world football association’s ethics committee, ostensibly its last bastion of decency, has had its work cut out for it lately. Not only did the committee suspend Blatter, it also banned UEFA boss Michel Platini, FIFA Secretary General Jérôme Valcke, and a long line of other senior officials. They also investigated Franz Beckenbauer, chairman of the organization committee for the 2006 World Cup – Germany’s “summer fairytale” – and those who helped him make it happen. The ethics committee’s credibility depends largely on the personal integrity of its leaders. Cornel Borbely, the Swiss lawyer who chairs the investigatory chamber, already has several complex investigations under his belt. The German chairman of the committee’s adjudicatory chamber, Hans Joachim Eckert, spent many years working as a criminal judge at Munich’s district court. It would be reasonable to expect that all members of these two bodies have been hand picked to serve as a corrective for the tarnished world football association. However, several of the 14 members were appointed during Blatter’s reign. In fact, three of them have sat on the ethics committee since it was established on October 23, 2006, including Juan Pedro Damiani. Damiani is an influential attorney from Uruguay and one of the country’s wealthiest men. He is also president of Peñarol Montevideo, the country’s most popular football team. In Eckert’s chamber, he sits in judgments over potentially corrupt FIFA members. Now, as a result of the Panama Papers revelations, Damiani has a problem of his own: the ethics committee has launched a preliminary investigation of its own member. Managing shell companies appears to be one of Damiani’s areas of expertise. The Panama Papers show that his law firm J.P. Damiani is among the bigger clients of Mossack Fonseca (Mossfon), a provider of offshore companies. Until now, Damiani’s firm has managed more than 400 such companies, many of which have been involved in scandals. The leaked documents reveal that Damiani, the FIFA ethics expert, also managed companies through which FIFA members may have received bribes. 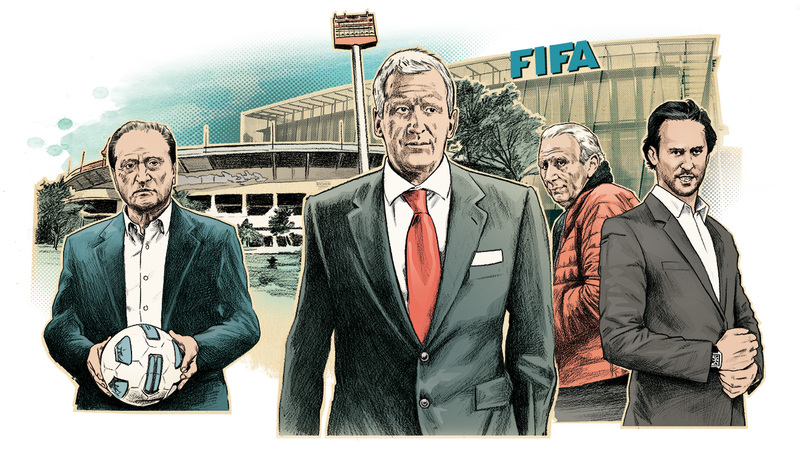 The Panama Papers show that his law firm’s offshore clients include three of the defendants in the FIFA scandal: Damiani’s fellow countryman and former FIFA vice-president Eugenio Figueredo, as well as Hugo Jinkis and his son Mariano Jinkis, two Argentinian businessmen who own and operate a football broadcasting rights company. According to the FBI allegations, the father and son team paid millions in bribes to senior FIFA officials in exchange for low-cost broadcasting rights that would then be sold at a high profit. These included the rights for the Copa América regional tournament, the South American equivalent of the European championship. The Jinkis allegedly used shell companies to make secret payments. In May 2015, the US Department of Justice brought charges against the Jinkis and twelve other people. In December of the same year, charges were brought against another 16 people. The American indictments repeatedly refer to a company called Cross Trading. According to the documents, several of the bribes paid to secure the TV rights deals were allegedly transferred via Cross Trading accounts. 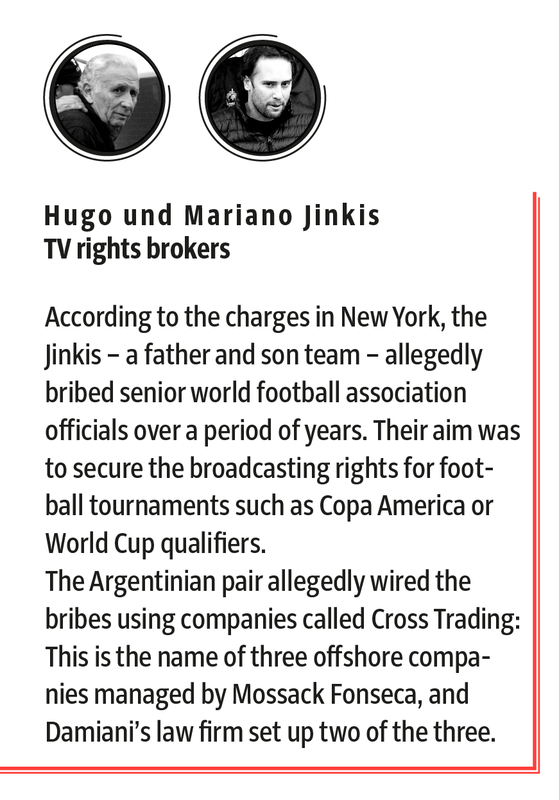 The Panama Papers now show that Damiani’s law firm aided Hugo and Mariano Jinkis in having Mossfon set up three shell companies – all three of them called Cross Trading. The companies are situated in three different tax havens: on Niue island in the South Pacific, in the US state of Nevada, and in the Seychelles. The J.P. Damiani law firm managed the Niue and Nevada companies. According to the US charges, on June 17, 2013, USD 5 million were wired to one of three Cross Trading accounts at the Hapoalim Bank in Zurich. Prior to this, the Jinkis had founded an agency called Datisa in cooperation with other sports marketers who now also face charges in the United States. The agency acquired the rights to all Copa America tournaments from 2015 to 2023, as well as to the Centennial Cup, for USD 317 million. In exchange, a total of USD 110 million were to be paid to officials at a number of football associations in Latin America. When the Swiss police arrested seven FIFA officials in Zurich at the United States’ request on May 27, 2015, payments amounting to USD 40 million had allegedly already been made. The FBI believes that the five million dollars that Cross Trading received were compensation payments between the companies involved in the bribery scheme. According to the US charges, the shell companies were used for another deal that allegedly unfolded as follows: in the fall of 2011, the Jinkis invited the chairs of the Honduran and Panamanian football associations, as well as a member of the FIFA executive committee, to a house in Uruguay. The three officials promised the rights brokers to help with the acquisition of marketing rights, for instance for the Gold Cup in the United States. The three were handsomely rewarded for their efforts: one of them received around USD 250,000, and the other two were paid USD 100,000 each. In this instance, too, the USD 450,000 appeared to come from a Cross Trading account. Hugo Jinkis and Mariano Jinkis did not respond to SZ and ICIJ’s request for comment on the allegations. The Panama Papers now reveal that Damiani’s law firm was involved from the time the first Cross Trading company was founded in Niue in 1998 until the Nevada firm was dissolved in 2015. Email correspondence suggests that he personally intervened whenever he felt that a client’s confidentiality was at risk. In one instance, when Mossfon employees opened an envelope with sensitive documents sent to the attention of Cross Trading, Damiani promptly emailed Mossfon headquarters in Panama to complain. He was also apparently copied into important email exchanges between his own law firm and Mossfon. Contract documents were thus also sent to him, meaning he could have been aware of the Jinkis’s activities. Client advisors at Mossfon also knew who they were dealing with. In an email, the Jinkis were described as clients who expected a “special confidentiality concept”. Juan Pedro Damiani organized this system of confidentiality. Let’s suppose that Damiani knew nothing about the Jinkis’ business practices until they were indicted in the United States. Even if this were the case, the Uruguayan lawyer should have at least disclosed his involvement to FIFA at that point. According to SZ information, Damiani still hadn’t done this at the beginning of April 2016. FIFA has declined to comment on the matter. Damiani has also left the questions about his involvement with the Jinkis unanswered. The Damiani case is especially delicate, as the Uruguayan lawyer appears to be involved in both sides of the corruption scandal. Damiani’s law firm not only helped set up shell companies for the parties charged with paying bribes, but also for those who allegedly received them. Starting at end of the 1990s, he worked for Eugenio Figueredo, 84, the former FIFA vice president. Figueredo has links to several offshore companies that Mossfon set up, complete with sham directors that concealed the companies’ true owners. Damiani’s law firm managed seven of these companies, which owned a chunk of real estate. As recently as February 2015, a power of attorney was granted to Figueredo’s wife power of attorney, which authorized her to act in the name of one of the companies. This company has since become the subject of a Uruguayan investigation. 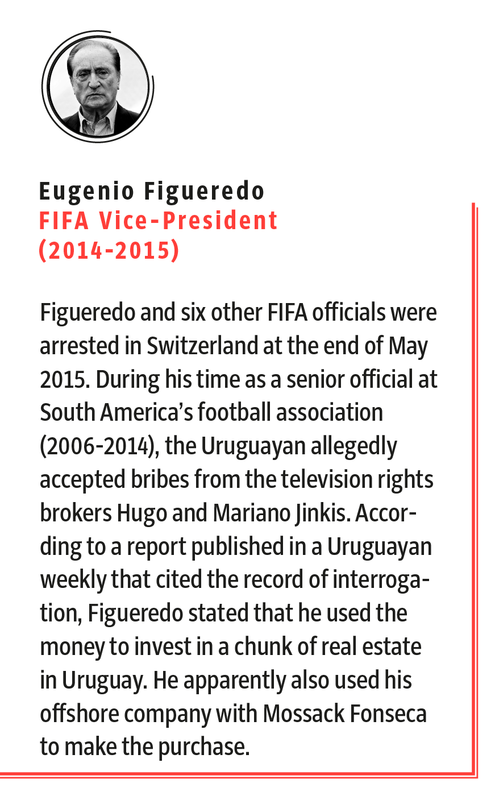 By the end of 2015, Figueredo had been extradited to Uruguay. Over the course of questioning, he apparently admitted to having accepted bribes, according to a report published in the Uruguayan weekly Busqueda, which gained access to the transcripts of Figueredo’s interrogation. The report states that Figueredo estimated the amount he received to about USD 50,000 per month. He also supposedly disclosed how he had reinvested the money by combining legal and illegal income to purchase real estate located mainly in Uruguay. Figueredo apparently explained that Panamanian companies purchased the real estate for him, and that Damiani’s law firm handled business with these companies. In January 2016, Damiani testified at the Figueredo trial in Montevideo. However, he only mentioned three offshore companies that he helped set up, and not all seven that appear in the Panama Papers. He claimed that his law firm had never received payment from Figueredo, and that he “never hid any goods.” What is more, he stated that his law firm had already provided investigators with “what little information” it had about the companies. As the Panama Papers show, Damiani may have had more information than he claimed. In fact, his law firm sent a very detailed list of the shell companies’ assets to Mossfon at their request, which included various real estate properties and a bank account. The email of May 29, 2015 also referred to six companies, not three. In response to SZ and ICIJ’s request for comment in March, a spokesperson for Damiani explained that he was only able to provide limited information in light of ongoing investigations. He stated that Damiani had, however, informed the authorities and the FIFA ethics committee. A spokesman for the FIFA ethics committee has confirmed this. However, he also stated that Damiani first informed the committee of his business relationship with Figueredo on March 18, 2016, one day after SZ had sent him a request for comment. According to the spokesperson, the ethics committee launched a preliminary investigation the next day to clarify the circumstances. 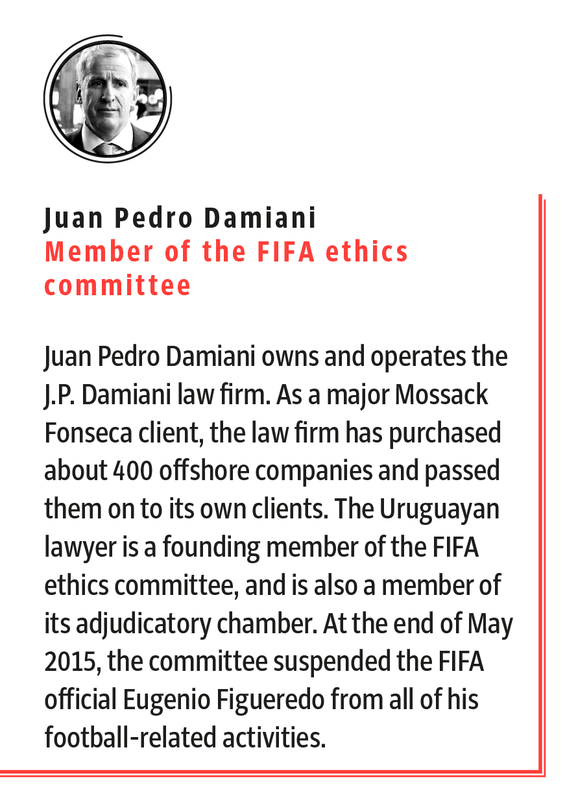 Juan Pedro Damiani, the ethics watchdog, is now himself now under his colleagues’ scrutiny.